Each school day, for the last 15 years, I have gone to work knowing that my three children’s bellies are full. I have set them up for success by ensuring that they have had a healthy breakfast. They are more attentive, active and not clock watching until the nutrition bell rings. As a Vice Principal, I am very happy to facilitate the same opportunity for my students with the support of the United Way and the Breakfast Programs of Canada. Each morning, I am able to offer students from kindergarten to grade eight , fresh fruit, grains and dairy options to ensure optimum success in our learning environment. Our Breakfast Program success is truly a team effort. Leaders from our grade eight class help with the food preparation and daily tallies, the office assistant ensures that we have enough food bought and I am able to survey my students each morning and as they start their day off on a positive note. I decided the best place for our Breakfast Program was the large front foyer of our school. It is an open airy space that allows our participants to sit at tables and interact with staff, other students and school community members. Our numbers fluctuate daily but on average each morning we serve 10 to 20 students. My first question, when issues arise on the yard, in the classroom or hallways of our school is consistently, “Did you have breakfast this morning?”. Finding out the reason or antecedent of the issue helps make the resolution a much quicker process. Besides our well stocked breakfast program, we also ensure that students who are hungry during nutrition breaks can find a healthy snack in the office. Again, fresh fruit, dairy and grains are made available to all students with a smile and no questions asked. This is the first year of a 100% volunteer driven Breakfast Program it is facilitated my by students, staff and I. As we have only been running our Breakfast Program for three months, I cannot give specific statistics how our program has decreased the issues in our school, but we are tracking and I am looking forward to observing a downward trend over the upcoming months. Elimination of hunger in my students has not solved every issue in my school, but it has ensured that all my students can start their day as my own children do, with a full stomach and the ability to focus on learning rather than on their empty stomachs. You can follow along with the conversation by visiting the Grocery Foundation site and following them on Facebook and Twitter . 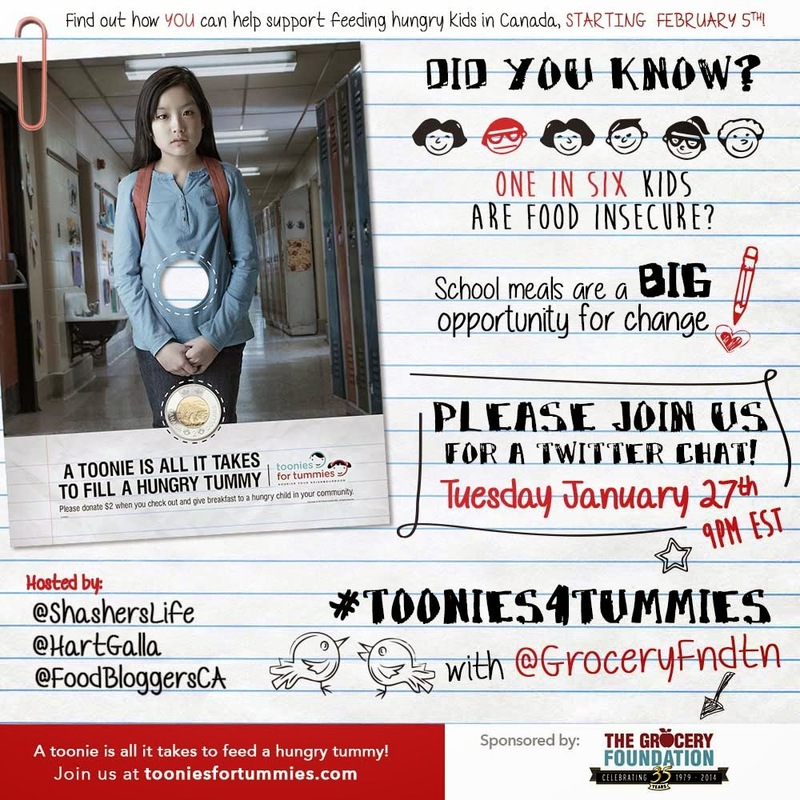 There is also #Toonies4Tummies Twitter party on January 27th, 2015 with the fabulous HartGalla & ShashersLife as moderators along with the fine folks from the Grocery Foundation . Join in the party and you learn how to track your toonie donation. 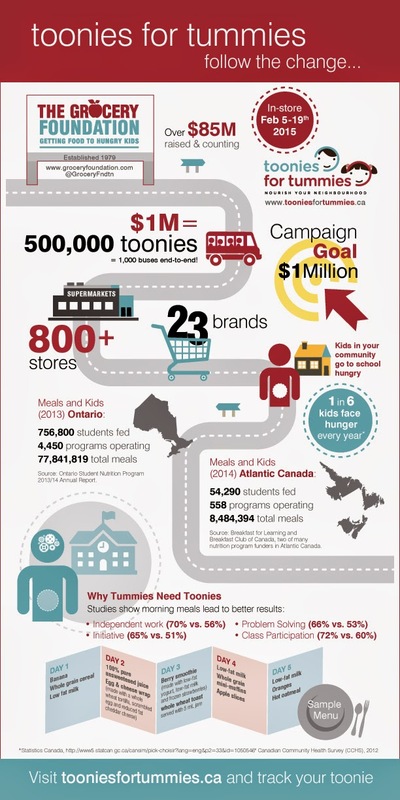 Then on February 5th, the very successful #TooniesforTummies campaign kicks off in Ontario and Atlantic Canada. As a parent, educator and community coach, I am very proud to be part of the #TooniesforTunnies campaign. I am supporting this campaign via SPLASH Media engagement on behalf of the Grocery Foundation. My story & experiences are my own.